Share files with your visitors on chat. Thanks to our Dropbox integration, you can share links to files and various materials with your website visitors on chat. This will help to save a lot of your time and allow to explain technicalities to your customers with ease. Dropbox is a free, off-site server for file sharing and storage. It allows you to synchronize your files across multiple devices automatically. You can add, edit, erase and access them on secure servers from any device (PC, Mac, iPhone, Android & Windows Phone) without any difficulty. You can also choose Dropbox Business and get help with team management. The tool will keep all of your data in one place and ensure that everything is always backed up. It lets you take control of who has access to which files and folders at scale. It allows you to monitor team activity, easily recover lost files or delete documents remotely from the stolen devices. Apart from that, it provides smart sync, administrative tools, and audit features. Keep your team moving quickly without having to dig up docs! With our Dropbox integration, you can easily share files with your customers – all of that without leaving your LiveChat app. All that it takes is a single click and bam. Now you can choose which file you want to share with your customer. Don't worry about any advanced configuration – with our native integration you can easily integrate LiveChat with Dropbox, saving time for things that really matter. And it comes with a tutorial as well! Save yourself a lot of time by sharing marketing, support and other materials stored on your Dropbox with your website visitors during chats. Process your clients’ inquiries much easier by sharing links to Dropbox files through live chat. By providing efficient customer service via chat and sending clients files that quickly help them solve problems, you will be able to make them satisfied. Just make a few clicks and increase your customer happiness by a mile! 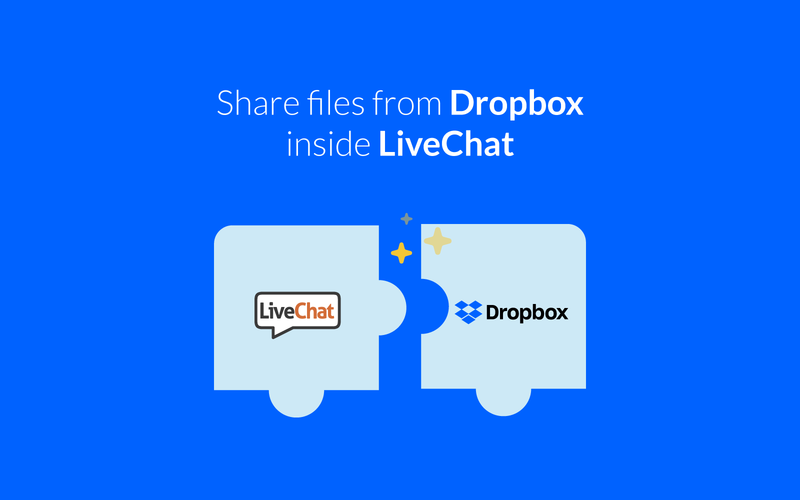 Start using LiveChat with Dropbox now!